Every year, my Kindergarten students participate in a very basic, whole-class research project. By listening to nonfiction texts read aloud and watching videos, students extract information to answer specific questions and build an understanding of the needs of a living organism. In the process, they retrieve information from multiple sources, learn key vocabulary, and present newly gained knowledge in written, visual, and oral form. We began our unit by completing the first two columns (“We Know” and “We Want to Know”) of a KWL chart. I then read aloud Penguins by The Cousteau Society and we completed the last column of the chart, “We Learned”. 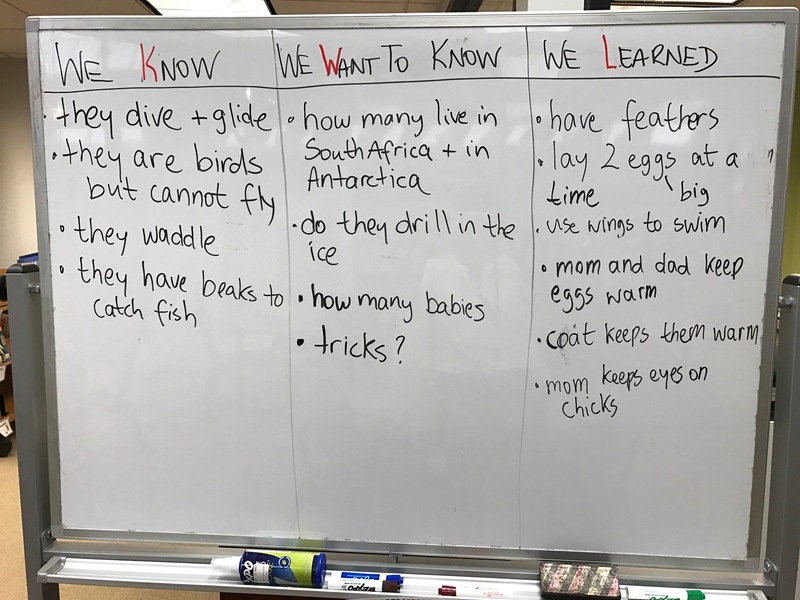 We finished the lesson by looking closely at an image of an emperor penguin and studying its body covering, feather coloring, naming its body parts and discussing their uses. Students finished the lesson by coloring an emperor penguin and writing a fact. Our second lesson focused on where penguins live and what they eat. To continue to make students aware that information can be found in different sources, we turned to the World Book Online database. While we consulted the main article only, it may be worth noting that the database contains articles on several of the better known types of penguins, which may be interesting to use for a compare/contrast lesson. 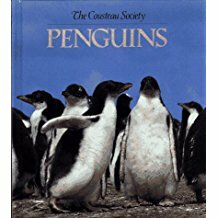 I read aloud the article, we watched the brief video about the different types of penguins, and listened to the sounds an emperor penguin makes. I also pulled up a world map and we found the equator and Antarctica, which is mentioned in the article as the place where most penguins lived. On a blackline world map, students colored Antarctica and added a sentence. On a separate sheet they drew three things penguins eat and labeled them. The third lesson was all about the life cycle of a penguin. 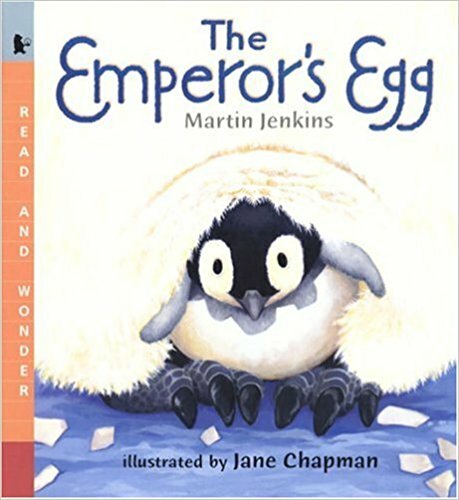 The Emperor’s Egg by Martin Jenkins is a perfect read aloud to introduce the topic. If you have time, there’s also a good video, The Penguin Story. We discussed the life cycle and students finished the lesson by coloring and labeling a graphic. While my lessons emphasized the research process, learning about penguins extended into the science and art classrooms, where students made blubber and created penguin art. To show their learning, I used student artwork displayed on the green screen and the DoInk app to record each student presenting facts about penguins. As the students had continuously shown their new understanding gained through observations and investigations throughout the unit, I had expected them to just talk in front of the screen; however, several of the students were happy to state one fact and leave it at that. 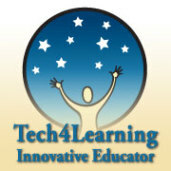 In all, the unit lasted one session per week for four weeks. At the conclusion of the unit, I stapled the students’ work together, adding a note to the parents briefly informing them about the unit and referring them to their child’s blog to watch their presentations. Enjoy learning all about penguins from these 5-year old kids!